Although many people only really think about how residential electricians can help them when they notice the lights flickering, the outlets not working, or the circuit breaker tripping, the reality is that there are a whole lot of things we can do to make your home a better place to live. Everyone wants to live in an environment that brings them rest and relaxation. It’s part of the reason we paint the walls, hang up art, and look for comfy furniture. After all, when your home looks the way you want it to look, you’re inherently more relaxed. At the end of the day, nothing beats going home to a living space that you enjoy, and although everything is decorated the way you want it to be, sometimes something just feels a little bit off. In many instances, it’s that the lighting isn’t appropriate for the mood you’re trying to create. This can be particularly true when it comes to the exterior of your home, and as luck would have it, that’s the area we’ll be focusing on in today’s post. If you’d like to make some changes to your outdoor space, we have some suggestions. Keep reading to learn more! 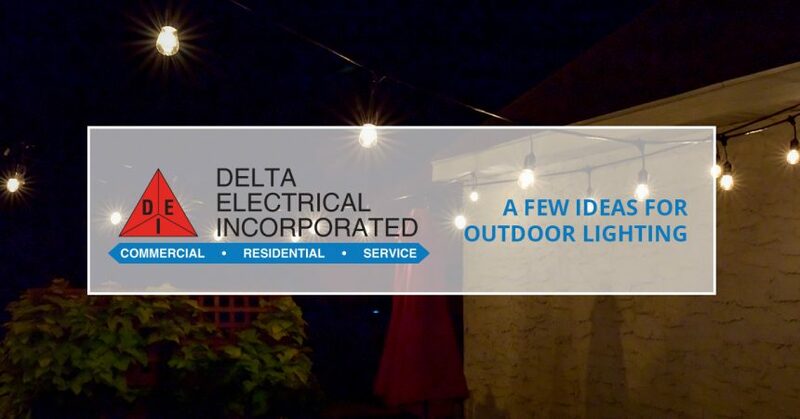 Although we regularly get calls for things like installing emergency backup generators, upgrading service panels, replacing ceiling fans, adding electrical wiring for hot tubs, and troubleshooting faulty wiring, the team at Delta Electrical is also known for installing outdoor lighting for security purposes or just to make the space a little cozier. In other words, regardless of your specific needs, our crew would be glad to lend a helping hand in making your home a better place for you to live. Whether you use them to illuminate the steps up your front walkway or highlight an area surrounding the patio in your backyard, having lights in the ground can make a bit impact on how you perceive your outdoor space. Although fairly easy for us to install, the end result is something truly beautiful that you’re sure to enjoy for many years to come. Also known as uplighting, it can help to make a space look more cozy and inviting, ensuring that you’ll actually enjoy spending time outside. If you have an awesome deck in your yard that has some stairs, step lighting represents a perfect way to light up the space. An added benefit is that it also makes your deck a little safer, ensuring that people can see where the steps are even after the sun goes down. A simple solution to making your outdoor space instantly cooler, string lights come in a variety of shapes and sizes, ensuring that no matter what you want your space to feel like, there’s something for you. Rather than dealing with cords everywhere, we can install them in such a way that you can turn them on from inside with the flick of a switch. It doesn’t get much better than that! What Are Your Ideas for Outdoor Lighting? Whether you prefer to use one of the ideas above or you have something else in mind, an electrical technician from Delta Electrical would be glad to help bring your vision to life. There’s nothing better than when your outdoor living space starts coming together because it means that whether you’ll be inviting friends and family over for barbecues in the summer or you’re just going to use it as a place to settle down and read a book at night, you’ll feel comfortable and cozy. Although good furniture, some plants and flowers, and a barbecue grill are all parts of the puzzle, it’s our opinion that lighting really makes or breaks an outdoor space. If you agree, we’d love nothing more than to help you pull it all together. Our team of residential electricians is always up to the task, and we’re licensed, bonded, and insured to get the job done right. With an average of 20 years of experience in our industry, you can count on us to provide your home with just the thing it needs to look great and be safe.